It is my 23rd Birthday today (Whoop whoop! ), and since I started blogging a couple of months ago, I thought it would be a great idea to capture the place I am at in my life right now, in the form of a letter, and address it to myself ten years on. So here goes! Happy Birthday! Gosh, this is strange, but I really hope that you are reading this ten years on, if God Willing I am still alive. 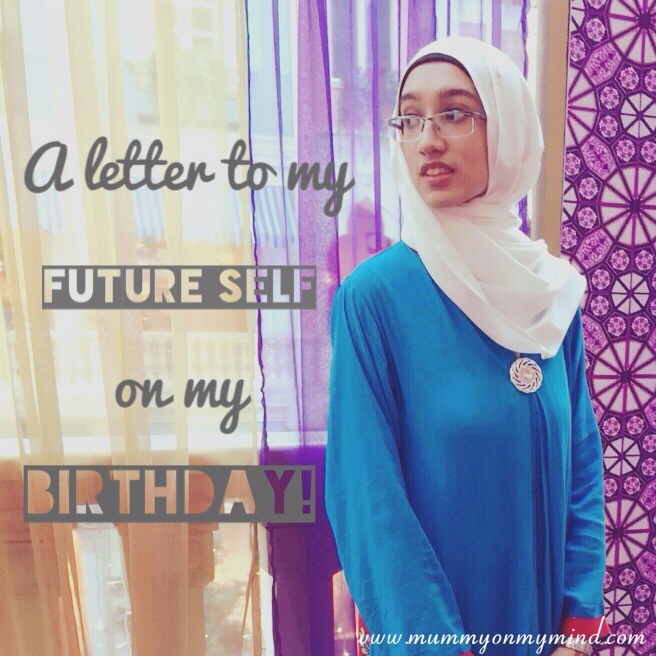 The reason for me writing this letter is to capture my 23 year old self and perhaps even give myself a couple of reminders as to what is so important to me. Ten years ago, family was everything, and I hope ten years on, it still is. Ten years ago you had a beautiful baby boy, causing mischief at the tender age of 15 months, who would melt your heart with a smile. Baby Z and motherhood have already taught you so much about yourself. I hope that you are still the fun loving parent that offers plenty of kisses and cuddles to your little one. Who knows if you have turned from being a “mother to one” to “mother of two (or more- blimey! )”, though at this stage it is very difficult to comprehend loving another human being as much as you love Baby Z. (Awkward moment if any of my other potential kids are reading this). Ten years ago, you would have been approaching your second anniversary of married life with Mr Z in a matter of days. Though you have been together for much longer than that, there are still new discoveries to be made about one another. As you approach your 22nd wedding anniversary I hope that Mr Z and you are still madly and deeply in love, always communicating to each other about the tiniest of things and being each other’s pillar of strength. Infact, I shan’t hope, because I know you will. For the past few birthdays, he has been gifting you each year with a Swarowski ring. I am curious as to whether he has carried on this tradition through out the years (and if the stones have got bigger/shinier!). Swarowski or not, Mr Z is your Mr. Right, and he will always love you till the very end. Ten years ago, you were living in Dubai, content with life, happiest when looking after the little one. Sometimes you missed your family and friends back in England terribly, but you also had so many things to be grateful for in Dubai that you wouldn’t change in the world. I don’t think you will have given up shawarmas and sunshine anytime soon, but who knows where you will be now! Whichever country you reside in, I hope your love to travel and discover new things is still going strong. How many countries have you visited now? If it’s not as many as you’d like, perhaps it’s time to book a flight! Remember, Florence is top on your list! Ten years ago, you started this little blog as a way of documenting motherhood and allowing yourself to have a creative output. I hope this has only gotten stronger and that this blog is still going strong. Perhaps the blog has turned into a mega hit and is read by thousands of people, or perhaps this blog has withered away into a tiny forgotten corner of the internet. Either way, you worked your heart and soul into it and are so proud of how far it has come in only a few months. Why not read back to your earliest posts and revive some memories of what being a young mother was like? Ten years ago your faith in religion was getting stronger, and I hope your Iman has carried on reaching new heights each day. Always be forever thankful for all that Allah has blessed you with, and only depend on Him when you go through dark times. Have faith in Allah and Him Alone. Ten years ago you were a confident and creative woman, vivacious mother, loving and supportive (okay, sometimes nagging) wife, and a passionate blogger/writer. I hope you are still all these things and more! Happy Birthday Zeyna! It’s my birthday today as well (6th August – not sure with time zone differences when you wrote this). Happy birthday to us! I am just a teeny bit (ahem) older than you though….This is a lovely post and a great idea. I am sure you will still be happy and loving life in ten years time, my guess is that you will have another baby and love it just as much as your first – it’s weird how it happens but your heart grows to fit in the new one. I hope you are getting spoiled today – we have just arrived in Pretoria and my husband has gone to work 🙂 Hopefully he is coming home to take us out to lunch though…..Just off to write a blog post about our first days here…. Happy Birthday to us! (Yes, 6th August) Thank you so much for the lovely comment, and I will take your word for it when you say love for the second child grows naturally. Hope you have a lovely Birthday lunch in Pretoria! I also plan to have a cosy family dinner to celebrate! Thanks for reading! ? Thank you! Haha what a great idea!! I will keep that in mind… ? Happy Birthday! That is a gorgeous blue outfit you are wearing in your picture. Thank you! My mum had actually sent that dress to me from England. Happy belated birthday Zeyna. I love this piece. Very cleverly worded and touching. It’s a really good idea. I have seen a similar letter done from younger to older self. Are you going to tuck it away somewhere private? It will be amazing to read back on – bet you’ll have a good weep! Thank you so much. Yes, I thought it would be something very interesting to write, and even more so to look back on! I sure will be stashing this away somewhere safe! Thanks for reading, and glad you enjoyed the post! ? Thank you for reading! Yes, that would be a great idea indeed!! ? Thanks for the lovely comment and reassurance Kirsten! Yes, iI hope I can remember to read it too! Thank you so much for the lovely comment, and thanks for hosting!